Chipotle paste is made from jalapeño peppers, and adds a delicious smoky flavour to the meat. 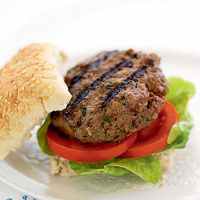 These burgers also work very well with pork mince. 60p per serving. Heat half the oil in a small frying pan and sauté the onions for 4–5 minutes until softened. Add the garlic and cook for 1 minute. Add the chipotle paste and cumin, and gently fry for 1–2 minutes. Remove from the heat and leave to cool. Place the beef in a mixing bowl with the egg, parsley and some seasoning. Stir in the cooled onion mixture and mix again. Use your hands to form the mixture into 6 burger shapes. Chill until ready to cook. Heat the remaining oil in a frying or griddle pan and cook the burgers for 8–10 minutes, turning once, until they are thoroughly cooked through with no pink meat. Alternatively, cook on a preheated barbecue. Serve the burgers in lightly toasted sesame-seed burger buns, together with torn Romaine lettuce leaves and tomato slices, with a dollop of tomato ketchup on the side. Liven up leftovers. Use chipotle paste in chilli con carne, Tex-Mex dishes, or to simply pep-up pasta sauces and baked beans. Try a Waitrose Czech Pilsner lager (500ml), which is crisp and hoppy, with a hint of sweetness that complements the chipotle’s smokiness.